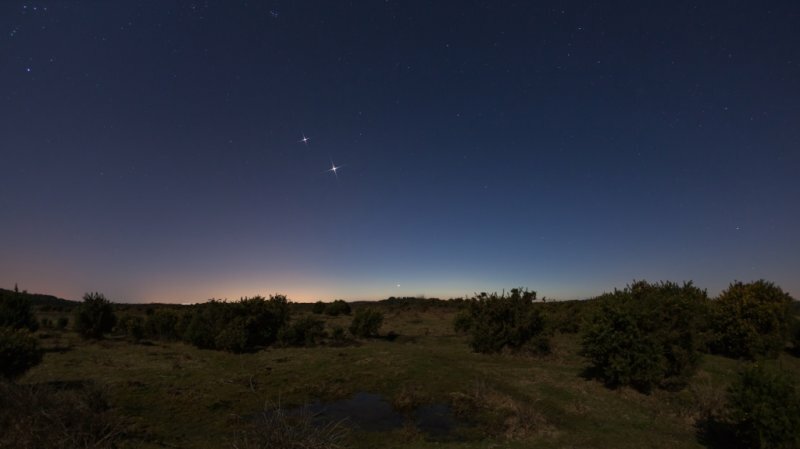 A Canon 5D MkII image taken over the New Forest at sunset on the 5th March 2012. Spikes used to show the 3 planets on display this evening – at the top we have Jupiter, just below Jupiter is Venus, and follow the line down to just above the horizon and we see tiny little Mercury closely following the Sun below the horizon. Remember – if you want to see Mercury DO NOT go scanning the horizon with any optical aid (binoculars, telescopes, spotting scopes, etc.) UNTIL the Sun has completely set, or alternatively well before the Sun has risen.